Let me start this review by saying, LOL. Growing up, whenever I used to hear Chuck Norris’ name, I would immediately think of a badass action star and a martial arts ninja. Nowadays when I hear his name referenced, I always tend to laugh a bit. Mainly from this whole pop culture icon status he has become in the form of being the ultimate badass who ever lived. For example one of my favorite Chuck Norris-ims: “When Chuck Norris does push-ups, he pushes the world away.” It’s quite amazing and hilarious how popular Norris has become in the last few years amongst the younger generation. 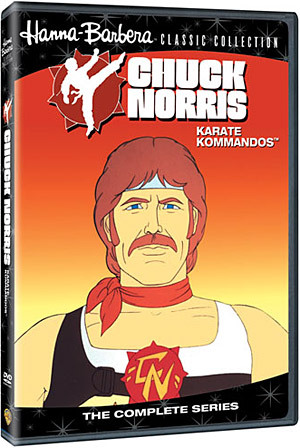 Growing up in the “Norris” era, I was exposed to ‘Delta Force’, ‘Missing In Action’, ‘Walker Texas Ranger’, ‘Sidekicks’, and the Hanna-Barbera cartoon series ‘Chuck Norris: Karate Kommandos’. Yes. At the peak of Chuck’s career, he was offered his own television cartoon series which only lasted five episodes. That was known as ‘Chuck Norris: Karate Kommandos’. And yes that’s how it is spelled. ‘Chuck Norris: Karate Kommandos’ follows a team of elite soldiers who battle evil. 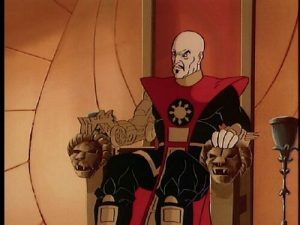 Notably the evil organization known as Vulture who is lead by the sinister Klaw and his right hand villain, “Super Ninja”. And you will know that Vulture has one goal and one goal only….ruling the world in their evil ways. But at every corner, Chuck Norris leads his team of Karate Kommandos to stop the evil Vulture organization and keeping the world safe. 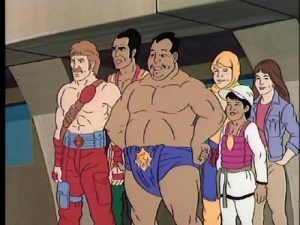 Being the 80’s action adventure it is, the cast of the Karate Kommandos consists of some pretty funny stereo types. One being Tabe, a sumo wrestling champion who is always eating or talking about eating. There is also a character called Too Much which the only dialogue the character utters is “Too Much”. There is also a samurai warrior, and technology expert, and a sort of intern for this elite team. It is all so corny and laugh out loud funny. I mean even in the shows 1 minute opening title sequence, you will hear the name “Chuck Norris” several times. And during each episode, you are treated to a real live lesson by the master himself, Chuck Norris. He is usually working out in his gym and he talks directly to you on a number of topics such as bullying in school. Chuck Norris and his comrades are helping a scientist named Dr. Sanford test experimental equipment that would enable people to breath underwater by converting water into oxygen. The Claw sends Super-Ninja and a female operative Angelfish named to lead his men to kidnap Dr. Sanford and break into Sealab. It’s up to Norris’ team to defend them both. The Claw places a bounty on Chuck Norris’ head in order to eliminate him once and for all, and at the same time he steals a computer chip that would permit him to gain control of Nato’s defenses. Chuck Norris and his comrades must get the chip back in order to protect the free world. When Super Ninja manages to capture Too-Much, Chuck Norris must rescue his young ward as well. Chuck Norris and his comrades are assigned to guard a robot laser while it is being transported, but The Claw has his eyes on the prize as well so he sends some of his best men to steal it. However, when Super Ninja plants some explosives onto the transport train, Norris must play his cards correctly or risk losing the lives of the passengers on board. Chuck Norris and his comrades head off to a space shuttle launch site in order to warn a general about The Claw’s plans, but they’re too late and The Claw manages to get away with the shuttle. To make matters worse, the space shuttle was carrying a fusion cannon that has the power to do unspeakable damage to any city in the world, so Norris decides to use an old space shuttle to go into space and stop Super Ninja before any damage is dealt. The Claw is attempting to bring down a United States satellite in order to reprogram it so he can gain control of all the nation’s military bases, so the president decides to send Chuck Norris to stop him. However, Super Ninja manages to distract Norris long enough for The Claw’s men to succeed. Norris and his comrades head off to Voodoo Island in hope of recovering the satellite, but things take a turn for the worse, and they discover that the island is full of the walking dead. This is a Warner Bros. only release and is only sold through Warner’s site. It is also noted that it is made to order, so you know this will be a collector’s item. Trust me. Pure 80’s GOLD here. Sadly there are no extras on this disc. Just the episodes and an episode guide. For you fans of Chuck Norris or the enthusiasts of the nostalgic 80’s, this is one rare gem you won’t want to miss. This is a moment in television history not to forget. This entry was posted on Sunday, May 29th, 2011 at 2:43 pm	and is filed under Film, News. You can follow any responses to this entry through the RSS 2.0 feed. You can skip to the end and leave a response. Pinging is currently not allowed. « Zach Braff Is Off To See The Wizard, The Wonderful Wizard Of Oz!?!?! ?